We used gold hands on our clock, but black would've looked nice, too. If you want to use colored hands, just purchase gold ones and spray paint them. To paint, balance each hand across the top of a plastic cup. Turn the cup upside down if the hand is too small to span the top of the cup. Make sure the hands are right-side up. Now, holding the can about 10" away from the hands, spray the hands with paint in the color of your choice. You don't need to spray the backs of the hands, because they won't show. As mentioned above, you can cut your clock face to any size or shape. 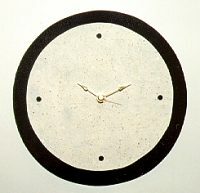 To make the clock that's pictured, you'll start by creating a circle with a diameter of 9". Place a pencil in your compass and set the compass to 4.5". Use the compass to scribe a circle on the back of your black card stock. Now, make a 7" circle of hand-made paper. Set your compass to 3.5" and scribe a circle on the back of your hand-made paper. Cut out both circles using scissors or a craft knife. Using the hole punch, cut four circles out of black card stock. These will be your 12:00, 3:00, 6:00 and 9:00 markers. Now use the protractor and ruler to place the markers. Place the protractor so that its base line runs through the center of your clock face. Draw a short (1/2") line through the center. Turn the protractor 90 degrees. Line it up so that the base line runs through the center of the clock face and the 90 degree mark runs along the first pencil line that you drew. Now make another short pencil line. Now you have a cross running through the center of your clock face. Line the ruler up with one of the lines you've drawn. Measure, along that line, 2" from the outside edge of the clock face. Use the pencil to make a small dot at that point. Line the ruler up with the same line, but this time make a mark 2" from the opposite edge of the clock face. Turn the clock face 90 degrees and repeat the procedures above. Now you have four dots on which to place your markers. Apply a small dot of glue to each of the pencil dots you drew. Glue a maker to each dot of glue. Let the glue dry. Read the assembly instructions on your clock works. The clock works will include a bolt that secures the hands to the clock face. Remove this bolt and use it to create a hole in the center of your clock face. Center the bolt and trace a circle around the inside of the bolt. Cut the circle out using a craft knife. Try placing your clock face on the clock works. If the hole is too small, trim it slightly with the craft knife. Repeat the procedure until the clock face slips onto the clock works. Assemble your clock using the instructions that come with your clock works.